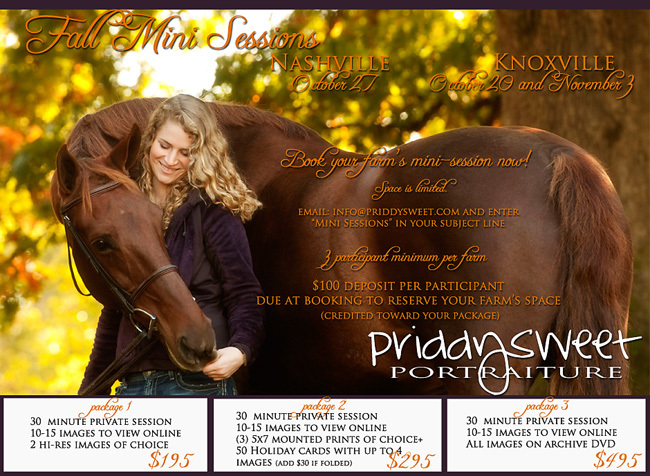 We’re so excited to announce that mini sessions are back in 2012! WOO HOO!!!! And this year, we are including digital items for the first time ever!!! So what are Mini Sessions? Mini Sessions are a smaller version of the real thing. They are 30 minute time slots versus the 2-4 hour full session times. They are great times to update photos for Christmas Cards and/or to document the year for scrapbooks/photo journals…even to update your wall art! These mini sessions are also great because they’re a great deal! 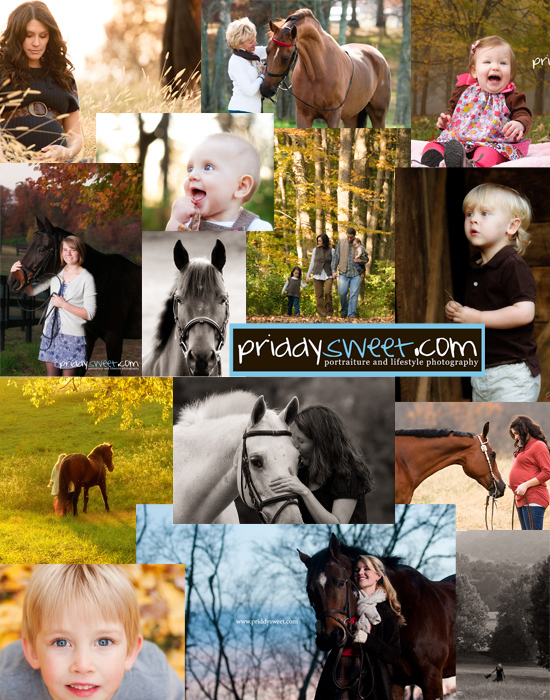 Grab your buddies and send an email to: info@priddysweet.com (or CLICK HERE) with the subject “MiniSessions” and we’ll get everyone scheduled! I truly can not wait to see you all and your amazing horses!!! Find us on facebook too!! See you all VERY SOON!! 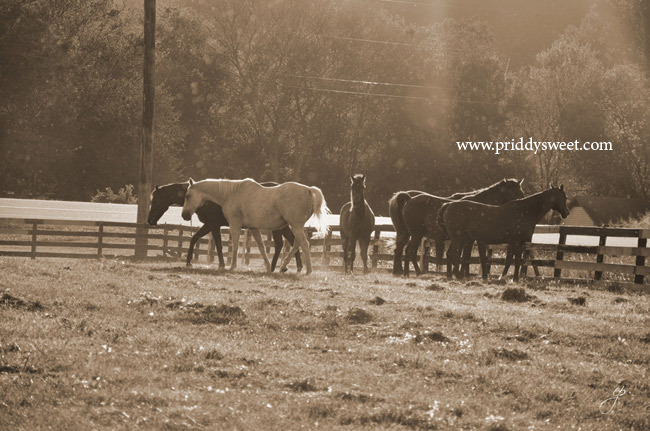 Confession: These are my favorite sessions– the equestrian maternity sessions. And seriously, the light could not have been more gorgeous that evening in west Knoxville (The light paling only in comparison to the gorgeous mom-to-be and her beau, of course). If I could post every single one of these images, I would. This is not a lie. Just ask Arlene. One of the sweetest and most gracious couples ever are Will and Arlene. I love being around them. I love their sense of humor and how much they love each other. It just seeps out of their pores. They’re truly in love and its SUCH a blessing just to be in their company. Not forgetting about Chester, and “baby” of course (* “baby” has two meanings with this crew…we have a horse named “Baby” as well as a child in the womb also called “baby” at the time…yep. learned that one the hard way* haha!! ), this family is just lots and lots of fun. 2011 was an awesome year for Priddysweet. We met lots of new faces and new ponies, welcomed babies and captured grins. Thank you to all who helped make this past year so successful. I hope that these images on your walls at home lift your hearts and spirits for many years to come! Enjoy the slideshow! Can’t see it on your iPhone or iPad? No worries! Watch it HERE on YouTube! * Winner to be chosen by random selection drawing on January 16. Each story will get one entry for a chance to win $100 in prints!!! Share your story on our Facebook wall (priddysweet . portraiture .) and via Twitter too (make sure and tag @priddysweets) for additional entries to win! “Like” our page while you’re there and “Follow” us on twitter if you haven’t yet! Its worth it, I promise!! Thank you ALL! !